The British Isles occupy a half-way point. Unlike North America, where bike racing has only comparatively recently come out of near-invisibility after a promising start early in the 20th Century, Britain, separated from the continent of Europe only by the English Channel, should have been positioned to make its presence known in the great races. But long before Mark Cavendish, Bradley Wiggins and Nicole Cooke, before those Scottish Millars (Robert and David), and even before ill-fated Tom Simpson, there wasn’t much of anything to make Union Jack-waving crowds cheer at a pro race. Instead, as Tony Newsom reveals in the stories that make up “A Racing Cyclist’s Worst Nightmare,” the British tradition of doughty amateurs fighting the good fight kept cycling alive in the post-World War II period, even when British cycling organizations were their own worst enemies. To Mr. Newsom, this was a Golden Age and his stories, whether memoir or fiction, are charming, often funny, and revealing of a very different world indeed. The collection includes memoirs of the author’s first outings by bicycle, and accounts of his participation in British races, including winning the 1955 Tour of Britain, as well as riding behind the Iron Curtain (and learning all about black marketeers) in the Workers’ Paradises of Poland, Czechoslovakia and East Germany during the Peace Race, the Warsaw Pact’s equivalent of the Tour de France. The latter, a case of “Innocents Abroad,” saw the unheralded British riders do quite well but it is clear that the Cold War made for very foreign places. 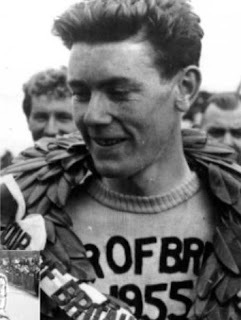 Mr. Newsom saw success in British races until his retirement in 1960, not really racing as a pro but not quite an amateur either. His account of his experiences with the short-lived Hercules racing team describes an organization where talent was supposed to somehow overcome a near-complete lack of money, management and support. It sounds a lot more like a Scott of the Antarctic approach than what Fausto Coppi or other Continental riders with the top teams were doing. Of course, some Euro pros also had an individual approach to racing. Mr. Newsom obviously has a soft spot for the peculiar and extremely aggressive Jean Robic, who won the 1947 Tour de France, apparently to indicate his displeasure for being passed over by the French national team. The Tour still had national teams at the time, although due to the bad feelings remaining from the recent war the “Italian” team was actually composed of French riders of Italian heritage! Robic constantly alienated the French cycling establishment and also attracted more than his share of bad luck as well, constantly crashing. This relentless, foul-mouthed Breton was a source of fascination to the young author, who, then a schoolboy in far-away Sheffield, avidly read the French publication Miroir Sprint (a sort of message-in-a bottle for cycling-starved Brits) and debated the merits of racers with his friends. And who could doubt the merits of the Buckshee Wheelers, one of the most unlikely cycling clubs ever? Nothing could have been more eccentrically British than a group of soldiers stationed in the desserts of North Africa during World War II wanting to form a cycling club, going on outings when not fighting Rommel’s Afrikakorps. It started with two cyclists, who were soon joined by ten others, but there was only one spare bike. An appeal to British manufacturers got them a hundred new bicycles and soon they were racing for the Bully Beef Trophy (25 mile time trial event with a can of beef mounted on a plinth as the prize) or at the Grand Prix de Ghezira road race in Cairo. Unsurprisingly, operation of the club required a great deal of resourcefulness to bend military rules and this virtue is obvious in a short story about three fictional Buckshee Wheelers, now back in postwar England, who discover cyclists are not always welcome guests at public houses. This entertaining story shines a light on what it was like to be in a country that, while victorious in war, still had its citizens under rationing. The cyclists are truly thrilled to find ham sandwiches (albeit with margarine rather than butter) and tomatoes at the pub, which speaks either of the deprivations of rationing or the limited ambition of English cuisine. Other stories suggest that cycling in Britain was a sport outside the norm, and its practitioners deemed nuisances and freaks, a view that persists in not a few English-speaking nations today. A tale that appears in all publications related to British cycling of this period is the ridiculous conflict between the allied National Cyclists Union (NCU) and the Road Time Trials Council (RRTC) against the upstart British League of Racing Cyclists (BLRC). The ultra-conservative NCU was opposed to racing on open roads, believing that civil authorities would not agree to it although there was no formal ban. Racing was either on flat, closed circuits or else in the British speciality, the secret time trial. Spectators were discouraged, cyclists dressed in black, and they went out on course at first light, pretending that they were just individuals out for a ride. The BLRC, on the other hand, called for Continental-style mass-start racing on public roads and quickly attracted a group of vociferous supporters, who actually shouted a battle cry: “Up the League!” The difficulty was the UCI recognized the NCU as the British governing body and the NCU was not prepared to let BLRC members race for Britain. Mr. Newsom identifies fiercely with the League and the whole chapter would be funny if not for the fact that the battle put obstacles in the way of British riders who wanted to race at the highest levels and prevented the kind of grass-roots racing structure that has always fed pro teams in continental Europe. Since the reorganization of British cycling in 1996, the nation’s cyclists have seen impressive achievements on both the track and in road racing. 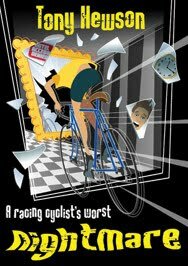 But “A Racing Cyclist’s Worst Nightmare” is a fascinating and entertaining look back at a truly foreign world but one where the passion to ride was at least as strong as today’s.